Carcasses of finless sharks are being unloaded from a fishing boat in the port of Benoa on the resort island of Bali, on February 25, 2013. Indonesia and India on Tuesday were named as the world's biggest catchers of sharks in an EU-backed probe into implementing a new pact to protect seven threatened species of sharks and rays. Indonesia and India on Tuesday were named as the world's biggest catchers of sharks in an EU-backed probe into implementing a new pact to protect seven threatened species of sharks and rays. The report was requested by the EU's executive European Commission following the listing of seven species of sharks and rays by the Convention on International Trade in Endangered Species (CITES) in Bangkok last March. 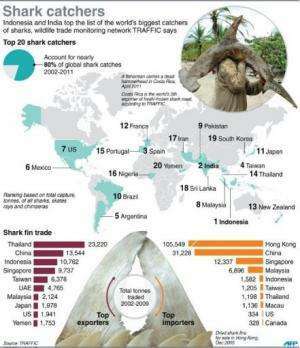 Graphic showing the world's biggest catchers of sharks, according to the wildlife trade monitoring network TRAFFIC. 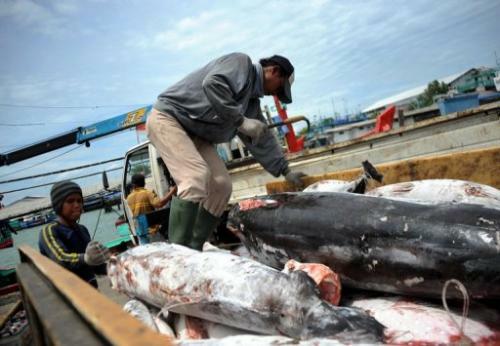 TRAFFIC—an alliance between green group WWF and the International Union for Conservation of Nature (IUCN)—said it had identified other countries that were major hubs for the trade in shark meat or shark parts. 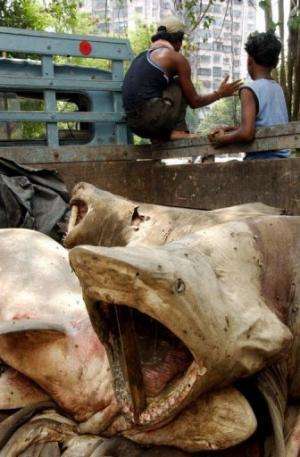 A truckload of sharks is pictured in Calcutta, on May 19, 2005. Indonesia and India on Tuesday were named as the world's biggest catchers of sharks in an EU-backed probe into implementing a new pact to protect seven threatened species of sharks and rays. The CITES controls will cover the ocean whitetip shark, porbeagle shark, three species of hammerhead shark and two species of manta rays, which are all classified as endangered on the IUCN's Red List.